Your dining room says a lot about how you are, and how you want others to see you. The dining room is for dinner parties, holidays, and special occasions -- a space for memorable moments and shared delight. It's important that your personality comes through in this room. 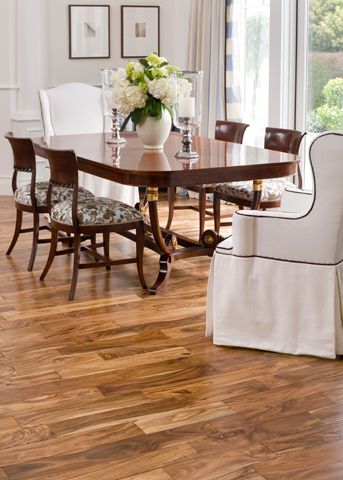 Hardwood flooring for the dining room is always an inviting option, and you can use it to say something about yourself. Darker dining room hardwood floors, for example, convey sophistication, confidence, and luxury. They act as a stage for showcasing exciting wall colors, rich fabrics, and unique furniture and accessories. You can also use varying plank lengths and widths to add visual interest without making the room too busy. Darker floors are great for hiding stains (because real life does involve accidents, after all!). All of Plank from United Tile's hardwood floors are hand-crafted by our skilled woodworkers. This artisanal touch adds warmth and depth to dark floors.Wondering which floors best represent your style? Contact us for assistance! This content is provided by our interior design partner firm Larson+Shores.